I have never been to Notre Dame in Paris. Still, my heart breaks for all of us. sur cette planète fragile que nous disons chez nous. Aujourd’hui, tant de gens sont dévastées. et ils veillent au milieu des ruines. Pourtant tu as promis de ne jamais nous oublier. Ne nous oublie pas maintenant. nous qui observons au loin. en la résurrection de ton Fils. nous sommes tous les enfants de Notre Dame. et ta promesse de la paix ne sera jamais ébranlée. maintenant et à jamais. Amen. Adapted from “A Prayer after the Earthquake in Haiti.” Copyright © 2010, 2015, 2019, Diana Macalintal, Diana@liturgy.life. Permission is given to reprint for non-commercial use. Photo: Bethany Beck, unsplash, CC0. through tears — that is a beautiful prayer. Can’t wait to see what the Lord has planned. Thank you so much! “In three days he will rebuild his Temple” let us prepare for The Resurrection! We mourn also in this sad loss. Even though you are oceans away we are right beside you in prayer and are just as deeply saddened by your loss but also just as hopefully that god will pour his grace and mercy upon you during these tough times. Thank you so much. How thoughtful. I felt heartbroken and prayer-less watching the fire. Will use this prayer as a meal blessing tonight when I have a friend over for supper. Thank you, Diana, for composing the prayer, and thanks to friends at LitPress for sharing it! Thank you in this time when so many people are speechless and confused. Amen. To God be the power and the glory..Amen and Amen. Let us pray in particular for the Church (with a big “C”) , the people of France! We pray that those who do not practice their faith or who are lukewarm, will return stronger and more committed than ever during this holy Easter season! Thank you, Diana, for sharing this beautiful prayer. I’ve been to Notre Dame Cathedral and it breaks my heart to think of that beautiful church filled with beautiful art being destroyed or even partially destroyed. A friend shared with me a picture that was posted showing the inside of the church, all dark with smoke so that you can’t make out details. But high in the front is a cross shining brightly. Christ reminding the people of Notre Dame and all of us that he is still with us. Thank you, Diana, for sharing this beautiful prayer. I’ve been to Notre Dame in Paris and it breaks my heart to think of this beautiful church filled with magnificent art being destroyed, or even partially destroyed. A friend shared with me a picture that was posted showing the interior of the church, almost totally dark from smoke. But high in the front is a cross shining brightly. Christ reminding the people of Notre Dame and all of us that he is till with us! Your prayer is beautiful, heartfelt and comforting in this terrible tragedy. My husband and I have been to Notre Dame many times, and the destruction of Our Lady’s Church saddens us beyond measure. Thank you for sharing your prayer with us. We grieve with you, let know that God is with us. Thank you for writing this beautiful prayer. We grieve with you, and you have given us the words to express our sadness at this horrible fire; the destruction of our beloved Notre Dame. We have visited the Church, gone to Mass there many, many times. Our prayers are with the people of France, for everyone including us who mourn this tragic loss. The news made my heart sink. The images made me cry. I have been there only once; 18years ago, and will pray for the day when I return to see it being refurbished. I too pray that those who have turned away or are lukewarm to our beautiful Catholic faith will return and help rebuild her from the inside out. WE need Notre Dame just as much as SHE needs us right now. Pray people, pray! This is our Holy Week and the Good Lord will carry you through this difficult time… You will emerge better than ever!!!! Holy Mary, Mother of Jesus, You are with us during these trying times. Pray for us. Thank you for this beautiful prayer. It is a help as we see the pain inflicted on this magnificent beauty. I have seen and prayed in this beautiful Cathedral many times. The last time I saw it, perhaps for the last time in person, the entire Cathedral was bathed in sunlight! 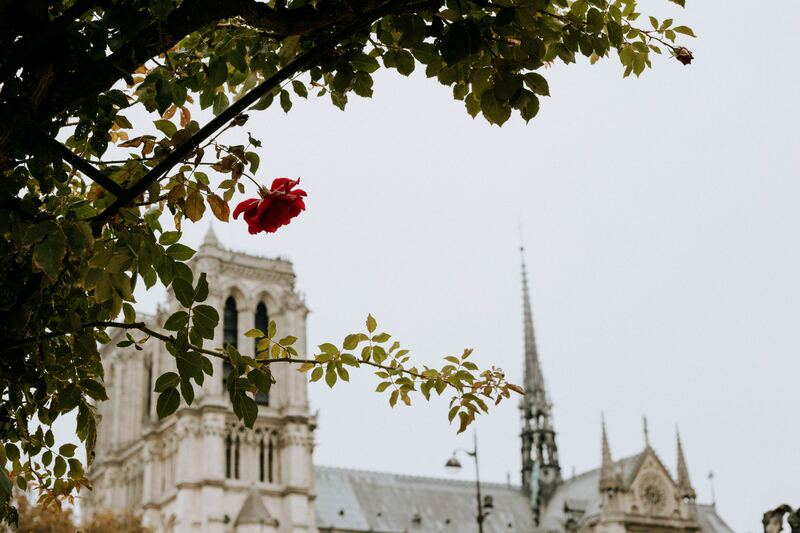 My heart weeps for the people of Paris, and all of France, for whom Notre Dame de Paris is a testimony to faith and to all that is good and deep. And I thank God for the generosity of those who will help to restore her to her grandeur. May The Holy Family take care you all. Amen! to all above responses. We were at the Cathedral in January 2016 during a pilgrimage with the Oblates of Mary Immaculate from San Antonio, TX and were privileged to have a small group Mass in one of the side chapels. We are speechless, and join the people of Paris, who have experienced so much sadness in recent years, in hope and prayer. We are also overwhelmed at the responses from all around the world. May this be a invitation to all who have doubted, all who feel abandoned by our God, to have faith as shown by the leaders in France and those who join in prayer this Holy Week. Yes, Sister Elizabeth, the cross will stand and be our anchor! Mary, Mother of God, hold your children in faith and strength. Jesus Christ is Risen. Christ is Risen, indeed. Thank you for sharing the beautiful prayer. I have visited Norte Dame several times and am saddened as I watch the fire. We are thankful some of the valuable items were saved. Those who have eyes to see and ears to hear ……let us ask for insight and deep understanding of the meaning of this fire at this time of lent and our church! Fire is the only element that transforms completely and a sign of the holy spiritual at work. Perhaps the time has come to honor Our Lady with more than buildings ? 5years from now at the dedication of a new cathedral may we also welcome and ordain daughters of Mary. I N G O D W E T R U S T.